Spiritual Adoption is an age-appropriate family-friendly program based on an idea by Archbishop Fulton Sheen in which participants pray for a specific, but unknown, unborn child for nine months, learn about fetal development during the "pregnancy", and celebrate with either a "baby shower" in which baby items are donated to a local pregnancy resource center, or a "birthday party". The program materials are available free of charge and consist of promotional brochures and flyers for parishes and schools, pledge cards, prayer cards, ideas for providing updates and education, and announcements for baby showers and birthday parties. Logo: In place of the stork that everyone knows safely delivers babies, is a dove -- the Holy Spirit, which represents the love and prayers of participants that peacefully deliver both unborn children and their parents. Participants in the Spiritual Adoption Program pledge to pray for nine months for an unborn baby. Since the child is adopted "spiritually", it is not necessary to identify an actual unborn child. This can be done in a parish or school setting, with age appropriate materials. At the end of the nine months of prayer, a baby shower is held to gather items for a local pregnancy resource center or other organization that provides support for mothers and babies. Encourage prayer for parents who are expecting a child; that they will respond to God's grace and welcome their child into life. Educate adults and children about the development of the pre-born child. Provide mothers in need with a 'baby shower' of donated baby gifts, or simply celebrate with a 'birthday party' at the conclusion of the program. As faithful Catholics we must understand how truly precious the gift of human life is. All too often in our efforts to share this beautiful message we find ourselves in discussions that require an understanding of theology, a knowledge of science, or a level of life experience which is exclusive of younger members of our faith. For this reason the Diocese of Kansas City-St. Joseph Respect Life Office sponsors this Spiritual Adoption program that can be enjoyed by all members of our Catholic family whether it is in our parishes, in our schools, or in our homes. How can my school, parish, or family participate in the Spiritual Adoption program? At the beginning of the program a pledge card or prayer card is completed with your name and the name you have decided to give to your adopted child. The prayer is recited at regular intervals throughout the nine months and a regular update on the development of the unborn child is provided in the form of a poster, a card, a bulletin announcement, etc. There are a number of options for promoting and implementing your Spiritual Adoption Program. A variety of prayer and pledge cards, progress update cards and posters, and program completion materials may be downloading from the list below. You may also customize your own program with additional merchandise available from website links below. 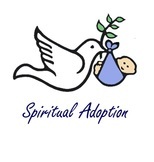 Personalize Your Spiritual Adoption Program! Below are the current volunteer opportunities for the Spiritual Adoption program. Please note “Spiritual Adoption” on the memo line of your check. Thank you!